Nevertheless, the recovery of voluntary arm movements is one of the most important goals during stroke rehabilitation in order to avoid long-term disability in activities of daily living (ADL), social and occupational activities, and depression. The aim of rehabilitation is to reduce impairment and minimize disability and a number of interventions to achieve these aims and improve arm function have been suggested. Since the large number of stroke survivors results in a high social and economical burden, and patients often experience difficulties to move to the rehabilitation centers, the home-rehabilitation approach represents a valuable solution to be persecuted. Moreover, home-based rehabilitation has been increasingly addressed during the last years showing promising results in terms of feasibility and impact on recovery , . Ab.Acus developed a home-based rehabilitation approach that takes advantage of daily living objects and Radio Frequency IDentification (RFID) technology, to enhance the effectiveness of the therapy. The innovation of this new approach lies in the possibility to use the patient’s own daily objects for the rehabilitation, improving acceptance and motivation of the therapy. This is the concept of smart objects, that allow to adapt the rehabilitation therapy to the patient’s daily living environment and activities. Ab.Acus smart objects are able to provide information about their characteristics and space location . They are equipped with RF passive tags, so that, using an appropriate reader, it is possible to retrieve in every moment the tag’s UID and its received signal strength indicator (RSSI). The UID is programmed to be unique for each object so that the signal received from a tag UID is associated to a specific smart object. The RSSI is proportional to the distance of the tag from the antenna of the reader (the higher the RSSI the closest are the antenna and the tag), thus the RSSI, correctly processed, indicates the relative distance between a smart object and the patient’s hand, on which the antenna is mounted. In order to take into account all the directions from which the hand of the patient can reach the object, multiple tags are placed on each object, to cover all the object’s area. Two categories of smart objects are present in Ab.Acus system: daily living objects and positions. The daily living objects (‘objects’ from here on) are the set of patient’s objects used during the exercises. The positions are marked by 3D printed discs used to identify a specific location in the space. Using the described setup customized therapy consisting in the repetition of functional tasks (e.g. reaching a position in the space with the hand, grasping an object, etc.) is run. Using a simple GUI hosted on a PC or a tablet, it is possible to set and execute rehabilitation training sessions composed of custom exercises. Each exercise consists of the sequential execution of predefined elementary tasks, that the therapist can combine choosing the order and timing. Furthermore, the objects involved in the execution of the exercises can be selected by the therapist, in order to maximize the effectiveness of the therapy by keeping a flexible and personalised design of all the variables of the exercises. The execution of the exercises is automatically controlled by the system, that is able to detect when a task has been completed (object reached, position reached, etc.) and instruct the user on the next task to be completed. In this way highly customizable therapies designed by specialist and training at home enhancing the frequency of the therapy and exploiting real object of the daily living are possible. The performance of the execution in terms of duration of the whole session and each phase, and tasks successfully completed is, then, computed and stored for the therapist to evaluate. This novel system is entering the phase of testing on patients to evaluate its performance. A. Fusco et al., “The ABC of tDCS : Effects of Anodal , Bilateral and Cathodal Montages of Transcranial Direct Current Stimulation in Patients with Stroke — A Pilot Study,” vol. 2013, 2013. L. Ke et al., “Telerehabilitation services for stroke ( Review ) Telerehabilitation services for stroke,” no. 12, pp. 2–4, 2013. P. Fearon and P. Langhorne, “Early Supported Discharge Trialists. Services for reducing duration of hospital care for acute stroke patients,” Cochrane Database Syst. Rev., no. 9, 2012. 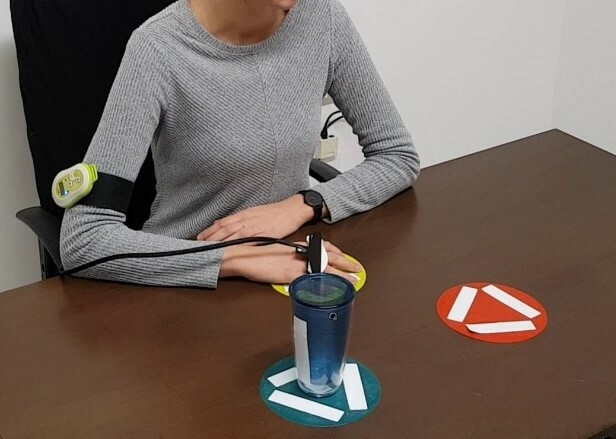 M. Bulgheroni, E. d’Amico, and L. Sartori, “RFID Technology for Objects Recognition and Their Position Estimation,” in Converging Clinical and Engineering Research on Neurorehabilitation, L. J. Pons, D. Torricelli, and M. Pajaro, Eds. Berlin, Heidelberg: Springer Berlin Heidelberg, 2013, pp. 1165–1169.